Religion plays a huge role in many people’s’ lives, and wanting to represent one’s faith using tattoos can be a great way to honor that. Different religions have different symbols associated with them, so we put together some of the most common ones that can be used to help you come up with some religious tattoo ideas. Read on to find out what kinds of symbols are linked to different denominations of faith. Catholic Tattoo Ideas – There are a number of symbols representing catholicism that can make for great Catholic tattoo ideas. The most recognizable and meaningful symbols that can be used include: a crucifix, Alpha and Omega, a cross, the Sacred Heart, IHS and Chi-Rho, a fish, fleur de lis, a dove, crossed keys, a lamb, a rosary, angels, and praying hands. Quotes from scripture or the bible that resonate with you and where you are in your life are great ideas for script tattoos as well. Jewish Tattoo Ideas – Judaism has a ton of meaningful symbolism that can be used for tattoo ideas if you’re a following of the faith. These symbols include: the menorah, four species, shofar, Star of David, the letter Shin, tablets of stone, Lion of Judah, Chai symbol, and hamsa. Quotes from the Torah that are meaningful to your life can also be great tattoo ideas. Muslim Tattoo Ideas – While there aren’t any specific symbols denoting the Islamic religion, a commonly used one that associated with this sect is that the crescent moon with a star, as well as the color green. Calligraphy script using phrases from the Quran are the most meaningful symbols of Islam that could be used for tattoos. Buddhist Tattoo Ideas – There are different sects of Buddhism so symbols vary depending on what kind of Buddhism you’re looking to represent. There are some symbols, however, that carry across most forms of the religion that can be used as tattoo ideas, including: the lotus flower, the mandala (or endless knot), goldenfish, victory banner, Wheel of Dharma, treasure vase, parasol, and conch shell. Imagery of specific deities can also be used, like that of Buddha himself. Christian Tattoo Ideas – Many of the symbols associated with Christianity are the same as those for Catholicism, but with some additional options. Christian symbols include: the cross, Ichthys, Alpha and Omega, Staurogram, Chi-Rho, IH monogram, IX monogram, the Good Shepherd, doves, a peacock, a pelican, an anchor, shamrock, lily crucifix, and elemental symbols. 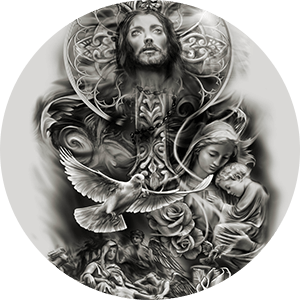 Sacramental quotes and icon imagery, like that of Christ or the Virgin Mary, are also powerful signs in Christianity which can be used in tattoos. Representing your religion through tattoos can be a powerful and meaningful way to keep your faith close to you. Knowing what kinds of symbolism to use and how to use it can make for an even better tattoo design, depending on what message you’re hoping to send with your ink. Do you have a religious tattoo? Let us know in the comments!